LAS VEGAS — The clock kept ticking, and Washington kept bricking. Eighteen minutes left in the game? The Huskies had 28 points. Seventeen left? Still 28. Same with 16 to go, and then 15 and eventually 11. Finally, at the 10:27 mark in the second half, big man Noah Dickerson put a layup through the net to end UW’s eight-minute scoring drought, but not before Oregon had built a 16-point lead. No doubt this was an off night for the Huskies, who made just 5 of their 23 three-point attempts. And no doubt the Ducks, who led the Pac-12 in scoring defense this year, know how to clamp down. 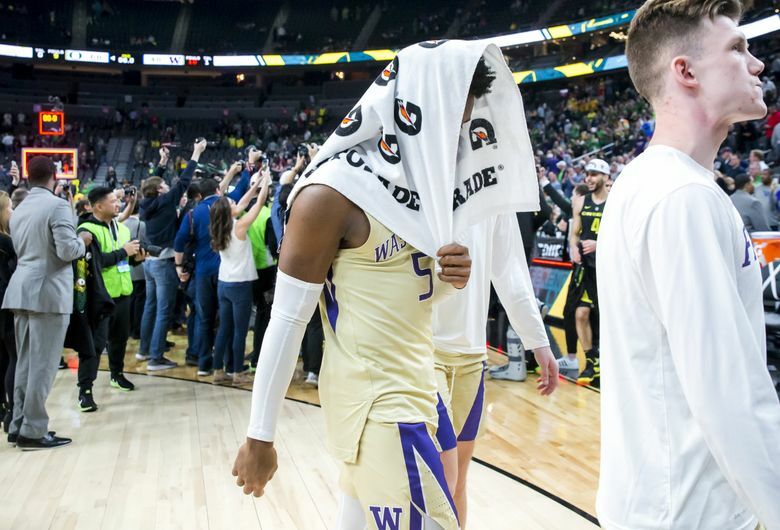 But Washington’s 68-48 loss in the conference tournament final Saturday was a testament to a larger issue: The Huskies have a scoring problem. According to NCAA.com, UW’s 70.4 points per game ranked 239th out of 351 teams before Saturday. They’re averaging 69.8 points now, which would have ranked 253rd. Obviously, the Huskies don’t fancy themselves as an offensive powerhouse. Their defense is the reason they won the Pac-12 regular-season title for the first time in seven years. But what do these offensive shortcomings mean when the NCAA tournament rolls around next week? Are they doomed if they face a team that takes care of the ball and regularly gets stops? I mention the “take care of the ball” part because a considerable amount of the Huskies’ points come off steals. They had 18 points off turnovers to Colorado’s seven in Friday’s semifinal win. They had 19 points off turnovers to Oregon State’s four in their last regular-season win. They had 18 points off turnovers vs. Stanford in Palo Alto (although the Cardinal did, too) and had 24 points off turnovers to Colorado’s seven in their previous meeting with the Buffs. But if the Huskies aren’t getting swipes and scoring in transition, they can stagnate offensively. Points out of the half-court set just weren’t happening against the Ducks, who held Washington to 18-of-54 shooting and a mere eight free throws. That 22-point second half was a 20-minute eyesore, as was the 19-point first half against Oregon last week. So what do the Huskies do? It’s unlikely that Hopkins will install an offensive revolution over the next few days, but the Huskies’ scoring struggles do underscore the value of their two best players: Jaylen Nowell and Matisse Thybulle. Nowell, the Pac-12 Player of the Year, is the guy who can create his own shot. And if he isn’t on his game, the Huskies aren’t reliable offensively. The sophomore entered Saturday averaging 16.3 points per game but scored just eight against Oregon. Thybulle, the Pac-12 Defensive Player of the Year, is the guy who creates the turnovers. The senior came into the game averaging 3.5 steals per game but had just one against the Ducks. The one he had led to a dunk and pushed him past Gary Payton for the most in Pac-12 history, but it’s clear Washington is a much less potent team when he isn’t getting takeaways. This is hardly doom and gloom for the Huskies, who have put up 81 points against Oregon State, 80 against Stanford and 79 against Gonzaga. And the Ducks deserve a lot of credit, particularly big man Kenny Wooten, who had all four of their blocks Saturday. But whether it was that first half against Cal in Seattle, or those first few minutes against Colorado Friday, or the last four halves against Oregon, we’ve seen plenty of stretches where the basketball refused to cooperate with Washington. There won’t be much suspense surrounding UW on Selection Sunday. The Huskies are going to be in the tournament — it’s just a matter of seeding now. But there will certainly be suspense during their first-round game, especially when it comes to scoring. The Huskies are built on defense. That’s what has kept their opponents from winning. But the Huskies also have issues on offense. That’s what could keep themselves from winning.